To start the new year right, Wash Park Art Gallery offers an exhibit of twenty artists, both painters and photographers, that will run through February 18. Holly Doan Spraul, gallery owner and curator, has covered the walls of this 19th century house with as many works as possible. One painting even hangs in the bathroom. Despite the range of artists and large number of works, this is no grab bag show. It is skillfully displayed, with the intention of showing how some of the works resonate with each other. A number of well-known Cincinnati artists appear in “Resolutions.” Large paintings by Cedric Cox and Tom Towhey face each other on opposite walls in the gallery’s main room. “Morricone at Music Hall” is a jazzy rendition of urban life with Cox’s characteristic symmetrical arrangement of fractured planes and strong color contrasts, in this case primarily gold and lavender. A graffiti-like design runs across the top of the painting; below is Music Hall behind a dynamic urban streetscape. In “Catchechism” Tom Towhey uses the interior of a topsy-turvy gothic tower to present an allegory suggested by his title. Disembodied figures, clothing without bodies inside, populate the painting. Two adolescent boys are tethered to a nun in a yellow habit to keep them from drifting out of the tower into an appealing world of blue sky and fluffy clouds. A third male figure appears too large to escape through a nearby window. The humor of the painting is offset by a prowling panther with bright yellow eyes fixed on the viewer. There is something fierce at the center of Towhey’s allegorical fantasy. Flanking Cedric Cox are a half dozen photographs from the series “Music Hall Renovation 2015-16” by Matthew Zory, a bass player for the Cincinnati Symphony. The ruins of buildings appeal to our imagination more than intact structures. In this case, the ruins of Music Hall are in the process of being restored. With his intimate knowledge of the building, Zory captures scenes of eerie beauty. We see the exposed bones of the building—balcony railings, pillars, ceilings, stairwells—in photographs imbued with luminous blues and oranges. The photographs have not been colorized; the mysterious colors are generated by Zory’s photographic process. 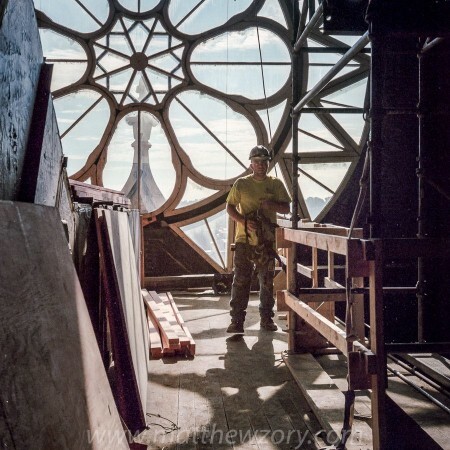 “Rose Window Portrait” resonates with the nearby painting of Music Hall by Cox and the gothic arches of “Catchechism.” A very real worker in t-shirt and hardhat stands in front of the fanciful window frame. Beyond the window is a decorative capstone, Cincinnati, and the sky. We are so used to looking at this iconic window from outside Music Hall, it is magical to look at the world from another direction. “Resolutions” mixes familiar artists with some relatively new to Cincinnati. One of the revelations for me is Ivan Ivanov, a painter born in Bulgaria, whose startling acrylic “Versus” is the most abstract work in the show. The composition suggests a landscape, soft cloud-like shapes above a dense mass of lines and shapes, some possibly human figures. 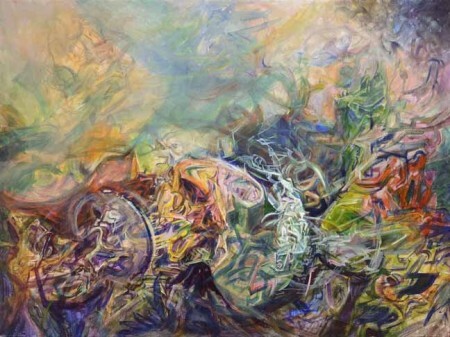 Ivanov’s bright, mostly primary colors are beautiful, but the painting has a frightening quality. The sky could be reflecting the fire of a great trash heap filled with the cheap, throw-away debris suffocating our planet. For me, this painting is an Inferno, depicting, with an incongruous beauty, the chaos and human suffering of our times. Opposite “Versus” is an expressionistic portrait by Kurt Grannan, “Amanda.” We move from Ivanov’s mass of humanity to a single, fragile woman. Every element in this work contributes to its psychological intensity. The figure occupies one half of the canvas; the other half is blank space. The pallor of Amanda’s skin is accentuated by red lipstick and her thin purple chemise. 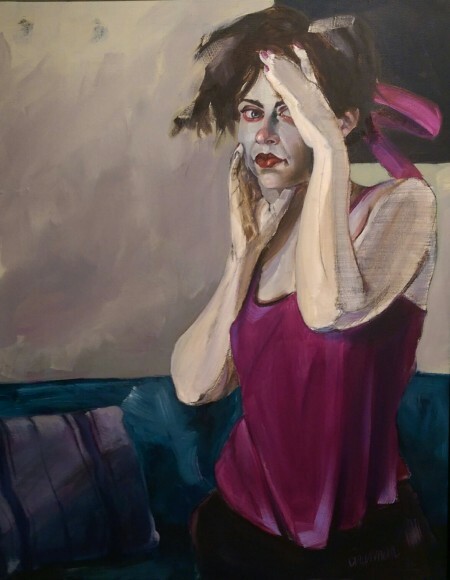 Her hands frame her face, almost as if she were composing herself to look, with one eye partly hidden, at the viewer. The portrait presents an overwhelming sense of the effort this fragile woman must make to hold herself together. Artists who take such a unique view of the familiar that it becomes unfamiliar can lead us into a world of the imagination we may not at first glance realize we have entered. The photographs of Chris Kalmbach, who is originally from Florida, work this deceptive magic on well-known Cincinnati scenes. In “Untitled” the massive concrete remnants of a long-gone bridge project out of a misty Ohio River near the Purple People Bridge. The photograph is a study of pure geometrical shapes: the trapezoidal pylons, the circular tie-off poles, the right angles of the embankment. Taken from the 6th Street ramp looking toward the back of the P&G towers, “Commuter” is a wonderfully complex photograph. It takes a moment for the viewer to get oriented to the view of downtown Cincinnati. The curve of the chain link fence along the ramp begins in the far distance and expands until it fills the entire top of the photograph. We see the texture of every link in the fence as it reaches the foreground. 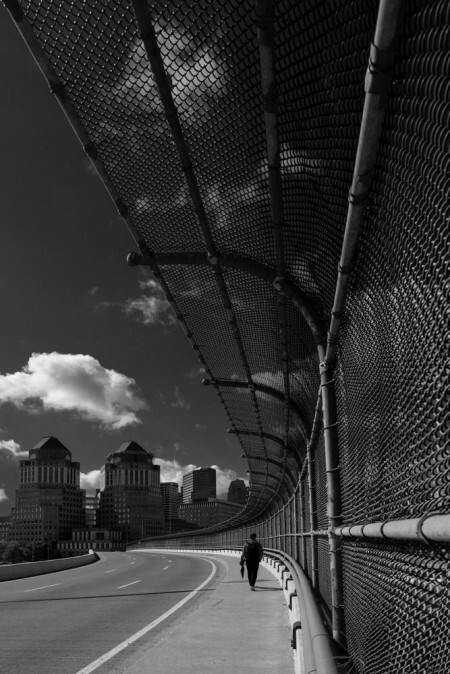 A lone man walks along the sidewalk toward the urban skyline. With his backpack and umbrella, he is a humble Everyman approaching a massive center of power. A few perfectly shaped clouds hang in the sky. This brilliantly composed photograph has an unsettling stillness and beauty. The five works of Melvin Toledo, a Nicaraguan painter who spent time in Cincinnati before moving to Atlanta, are a highlight of this show. Toledo paints in oil on aluminum panels with prodigious skill. His small paintings might initially be misclassified as photorealism because he depicts his subjects—roses, a bowl of chili peppers, a chocolate bar—with such exacting detail. In fact, the detail is so exacting that the real turns into the fantastic. The multi-colored roses in “Roses” are more perfect than any roses found in the natural world. The roses, along with crinkled paper, rest on a reflecting glass shelf. The dark background that sets off the roses is interrupted by an inexplicable band of vivid blue that keeps the painting from being an imitation Old Master still life. The painting glows with light that comes from within the roses and the paper. 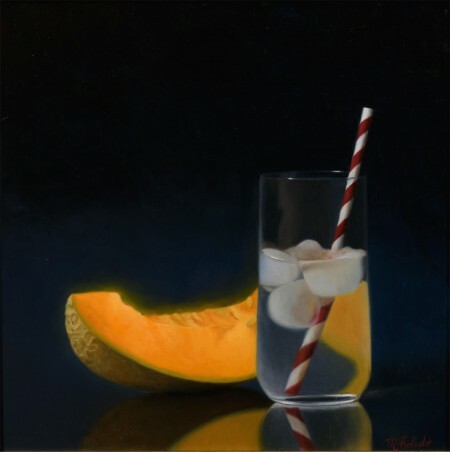 This inner light is even more spectacularly present in “Iced Water with Melon,” where the light from a glowing slice of cantaloupe is refracted through a glass of water and seen in a reflecting surface. Toledo is neither a photorealist nor a painter of idealized forms. As a result of his enormous skill with texture and light in painting, we experience a rich tactile enjoyment when view see his work. Resolve to see “Resolutions.” It contains more artists than one review can address. All have their own take on the world of the imagination. All are worthy of a visit to Wash Park Art Gallery to enjoy this exciting show.